Today Ron and I worked together mapping out Ichiro's front. 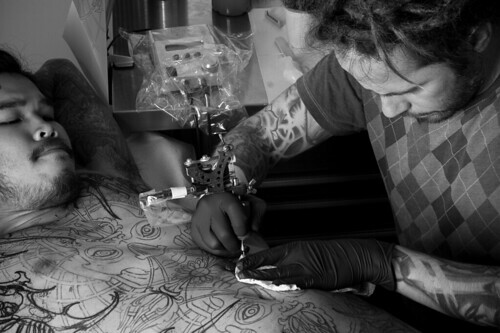 Ichiro's entire body is covered, almost exclusively, with various biomechanical pieces by different tattooers. When he asked me to undertake his front I was at a bit of a loss. I havent done any biomechanic forms in years and wasnt too excited about teaching myself how to do it again. Enter Ron Earhart. He encapsulated the "inner" imagery with "exo" forms that he does so well. Strong exo forms over meta geometric omphalic imagery. I think this will work.